The Trislander was an unusual development of the highly successful Islander. There was a need for an aircraft with similar operating economics to the Islander but with a greater passenger load. There were two alternatives; design another aircraft (expensive!) or develop the Islander. Extending the fuselage was a good idea but putting larger engines on the wing was not a viable idea for a variety of reasons. There were jet aircraft flying with a tail-mounted engine so John Britten and Desmond Norman thought that it should work with piston engines. So was born the Trislander or, as Flight magazine called it at the time, ‘The Tuppeny Trident’. The aircraft first flew in September 1970, just in time for that year’s Farnborough Air Show and it is still in use to this day. 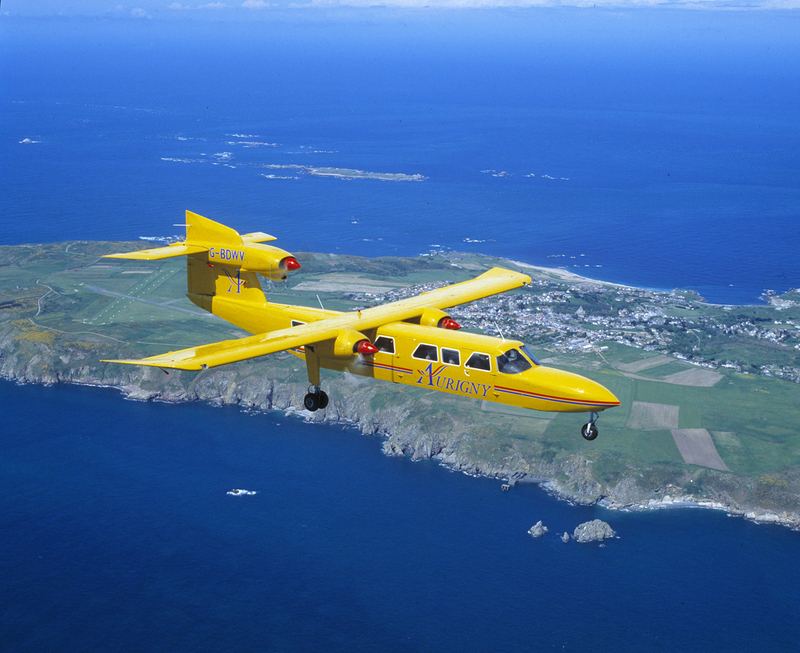 This particular example was photographed for Aurigny Airlines based in the Channel Islands and is seen here over the island of Alderney.